Make the Cut is currently limited to residents of Arkansas. Members residing outside of Arkansas will be notified as additional states are added. Create a profile now to get started. Compete against your friends to find out! 1. Pick a tour to compete. 2. Choose 5 players before it starts. 3. Have at least 3 players remaining. 4. Score is the sum of best 3 players. At the start of the tournament, choose 5 players. To Make the Cut you must have 3 players in the tournament by end of play on Friday or you're out. Want to challenge your friends? Refer a friend to Make the Cut today! Tournament results are updated throughout the tour. See where your players are and how you stack up against your friends from beginning to end. Must have 3 players remaining by the end of play on Friday or you're out! 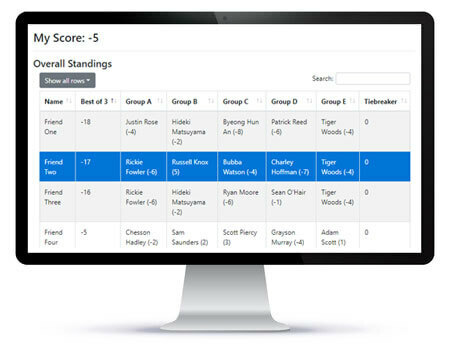 Your score is the sum of your best 3 players at the end of the tour. The member with the best overall score wins. Got a referral to join? Register here now.